Six weeks after Hurricane Maria wreaked havoc on Puerto Rico and shuttered its public school system, Education Secretary Betsy DeVos visited the island Wednesday and pledged $2 million in federal money to assist the island’s education department in reopening its campuses, according to local officials. Hurricane Maria struck Puerto Rico on Sept. 20 as a Category 4 storm, closing the island’s 1,113 public schools that served 347,000 students. Education Week reported Wednesday that 614 of the schools — more than half — have since reopened. DeVos met with Puerto Rico Gov. 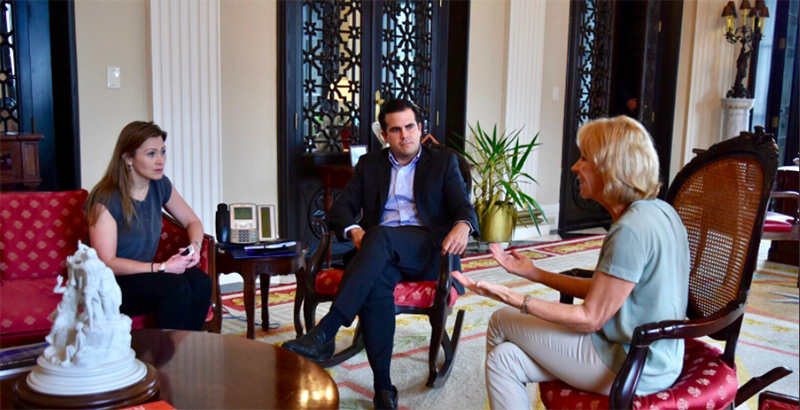 Ricardo Rosselló and the U.S. territory’s education secretary, Julia Keleher, before traveling to the U.S. Virgin Islands, where she toured Charlotte Amalie High School and the University of the Virgin Islands in St. Thomas. During the Virgin Islands stop, DeVos met with Gov. Kenneth Mapp and officials with the Virgin Islands Department of Education and the St. Thomas School District. Junto a la secretaria de Educación Federal, Betsy DeVos y la secretaria de Educación estatal, Julia Keleher visitando la escuela Loaíza Cordero. Last month, members of Congress sent a letter to DeVos and Office of Management and Budget Director Mick Mulvaney, urging the Trump administration to provide “immediate financial assistance” to help Puerto Rico’s storm-damaged schools reopen. For classes to resume, each building must first be inspected by the Army Corps of Engineers and be structurally sound and have running water. Many have reopened without electricity. Severe damage has forced the permanent closure of 44 schools, Politico reported, and students who previously attended those campuses will be relocated. Despite Hurricane Maria’s destruction, Keleher has remained optimistic. She told The 74 last month that the storm provided educators with an opportunity to rethink Puerto Rico’s schools, which have lagged academically for years. Even before the storm, Keleher was working to reshape the island’s education bureaucracy, which she said was strained by inefficiencies. Last spring, the department shuttered nearly 200 schools in the midst of a $73 billion debt crisis that pushed the island into a form of bankruptcy. “Of the things I need to worry about — the buildings, the poisoning from rats being around, the flooding, moving kids, transportation, sliding roads — the thing that worries me the most is that somehow I’m not going to deliver on this learning opportunity, this transformational opportunity for us to start to think fundamentally differently about what it is to be in school, and how one goes about getting an education,” Keleher said.